A mage of sorts that loves Mexican food. The Nachomancer (Caseum evocator) is a boss-monster that only lives in dungeons made of giant tortilla chips, usually ones that are bowl-shaped. It derives its power to cast spells from the molten hot pit of nacho cheese in the center of the dungeon, which is enchanted when a magical Habanero is put into it by the Nachomancer, after he fills it with nacho cheese. Nocturnal and solitary by nature, it sometimes ventures out for a mate on 5th of May. Chip Dip : The Nachomancer summons a wave of steaming hot nacho sauce. Refried Bean Punch: The Nachomancer summons a fist made of refried beans. Undead Chicken Burrito: No comment... Just... an absolutely terrifying creature. Thankfully, due to it not having a head, it runs straight into the pit of nacho cheese and dies again. Possibly only a scare tactic by the Nachomancer. Taquito Staff: The Nachomancer carries around a taquito staff that he uses to draw power from the enchanted nacho cheese pit. Tortilla Shield: Sometimes if the Nachomancer feels threatened by the enemy it will use a tortilla shield to block attacks. 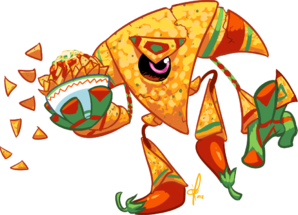 Salsa Bomb: The Nachomancer throws a highly lethal and sticky bowl of salsa that immobilizes and burns its prey. This monster is afraid of getting soggy, and, although beer goes well with nachos, it is terribly afraid of beer and pretty much any other liquid. This page was last edited on 22 February 2019, at 15:19.